Writing – Page 3 – Brendan Mancilla, Author. 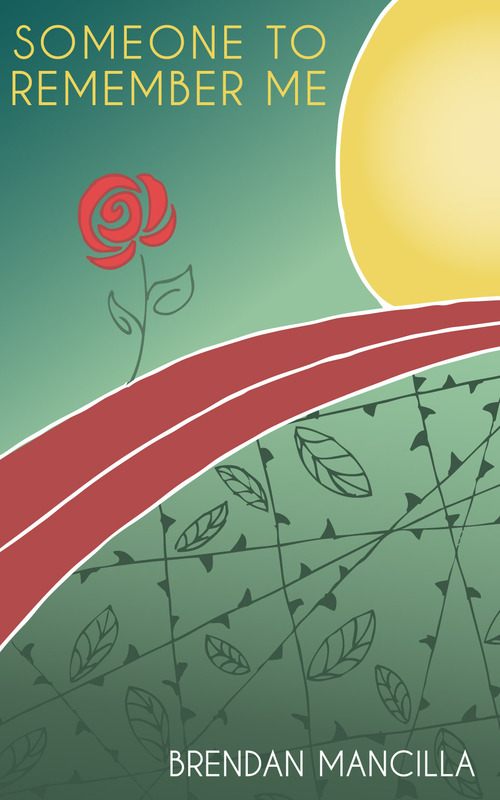 If you read one post this year that makes you love literature even more, make it this one! Writing, believe it or not, is easy. Are the first words that hit the paper automatic gold? Nope. Far from it. But like any other talent or skill, writing is something you get better at the more you try and fail at it. Today’s post is about the planning stage—the things you can do before you sit down to write your next book that will help it hit the top of the New York Times Bestseller List twice as fast. (Editor’s Note: This is hyperbole. I’ve never been to the top of that particular list, so results will vary.) These are a few tips and tricks that I’ve picked up over the past year that I think make a big difference in my writing that add to my overall feelings of accomplishment when I finish a project. In my experience there are two ways to begin the process and these are to either a) plan nothing or b) plan everything. This is a gross oversimplification but it gets the general point across extremely well. Chances are that you, as a writer, will bounce between these two as you grow and experiment with your own style. Speaking personally, I used to hate planning my books. Or I would plan only a fraction of the work as a whole, as I tried to allow the spirit of the story to guide my process. As I undertook more ambitious projects, which were namely books in a series, planning became increasingly crucial to the long-term viability of the books. What I’ve discovered is that, like building a house with many rooms, you need detailed blueprints for a book. Without them, the whole undertaking falls apart leaving behind an absolute mess. What I found as I undertook more and more ambitious projects (specifically books in a series) is that I would lose track of the many things I wanted to explore. Character interactions, particular scenes, powerful events…all those little details that kindled my original interest in that project. Since then I’ve moved closer to the planning side of things, though I try to leave room for a lot of spontaneity. Tell them anyways. When you take for granted that people know what grass looks like, or what the beach smells like, or how the mist feels, you’re only hurting yourself. Take the opportunity of outlining to include the details that interest you, the scenes that you want to write. Forget plot for five minutes and write something you don’t think is exactly necessary but would be fun to include. I recently wrote a scene where two characters sit outside a barn and gaze at the stars. Does it bring them any closer to the climax of the novel? No. Does it advance the plot? Not really. Was it something that screamed at me to write it for a week? Heck yes. You, as the writer, are the first and most importance member of your audience. Write to yourself first and to others second. Dare to stray from your outline. While a major advantage of planning is that I get all of my thoughts into one document, keep in mind that this reference document is a living, breathing entity. In life, few things go strictly according to plan. Let your literature reflect that. Allow your outline to reflect that. Add the unexpected, the dangerous, and the frightening as it occurs to you. Keep what works, remove what doesn’t. I often dare myself to stray from my outline. To push the boundaries of my story in creative and exciting ways. I invite you to do the same. 3. Create Characters Who Don’t Always Get Along. Coming back to the realities of the world, you won’t always get along with everyone you meet. It’s an unfortunate but wonderful truth that you can apply to your writing. If you’re writing six books and a movie and your characters get along from day one, how the hell are you going to fill all those empty pages with meaningful, witty, and emotional text? Remember how Hermione didn’t get along with Harry and Ron until they saved her from a mountain troll? I call this Mountain Troll Rule. Relationships take work, since the most important ones usually start off on the wrong foot. Giving characters oppositional attitudes and dispositions means you’ve given them something to squabble over. Divisions to impede their ability to work together. Differences they’ll have to work past in order to win at the end of the book. Reflecting the complexities of interpersonal communications in the men and women you create makes for good reading, so pile on the dysfunction. I often purposefully design oppositional characters. For instance, I wrote an ultra-religious character specifically to conflict with with another character who is, at best, a pessimistic agnostic. Or, another time, I wrote a very duty-bound character in opposition to a flippant opportunist. Life and literature are regularly filled with binaries since people rarely trust one another at first sight, and would sooner argue rather than consider the opposing viewpoint. I try to reflect this in my writing as often as possible. In my experience, I’ve found that it adds multiple layers to the ending my stories, whether they end in the highest triumph or the lowest defeat. 4. Take Breaks. Lots of Them. Know when you need a break from writing. I believe that being exhausted is the kiss of death to your creativity, so learn to recognize when you need to take a step back and do other things for a while. During these breaks I highly recommend daydreaming. Seriously, I don’t know how I’d survive if I couldn’t daydream. I let my creative impulses go on safari for a few minutes, brainstorming all the stuff I’ve yet to try but long for the opportunity to do so. Oddly enough, this tip relates directly to the first, which was to plan. Keep in mind that planning is great and all, but remember that an idea that just pops into your head is worth as much as one that you’ve already written down. If you’re not having fun, you’re doing it wrong. There will be times when you write something that you don’t like. It’ll feel clunky and awkward. Your general opinion of it will be that you don’t like it but it’s necessary to the plot, to the characters, or to some other broader excuse. It took me a long time to figure out a good answer to these conundrums, but I’m proud of my simple-yet-amazing solution: toss it out. If you don’t like what you’ve written you need to rework it. Revise it. Redo it. Rewrite it. Do whatever it takes to make what you’re writing something to be proud of. Something you can’t wait to share. Readers can spot passages and chapters that the author obviously felt the need to grind through. Don’t let that happen to you. I’m not saying it doesn’t still happen to me, but the sooner you get comfortable with trashing something you don’t like, the sooner you’re writing something you love. As always, I appreciate your attention and readership. Feel free to drop me a line or post in the comments with any questions! 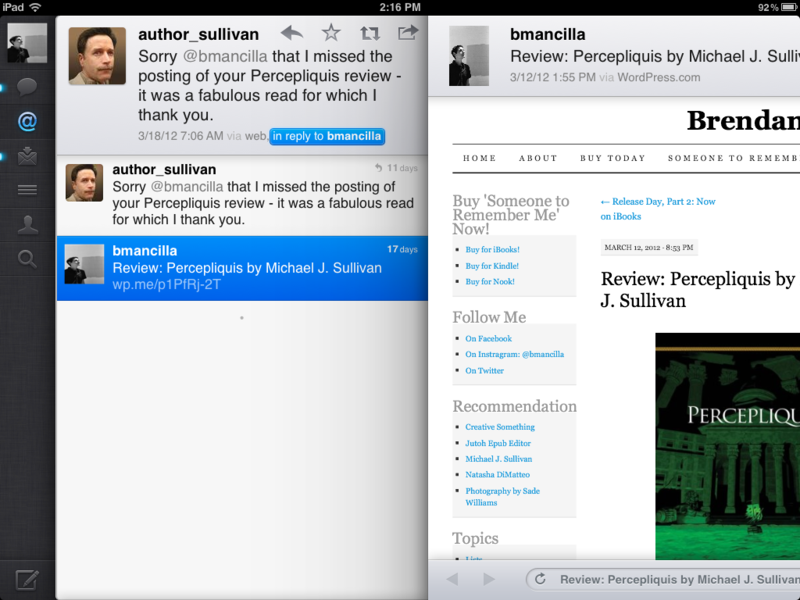 So not that long ago I wrote a review for Michael Sullivan’s epic fantasy novel “Percepliquis” and initially posted it to Amazon.com’s website here. At some point after that I got an email saying there was a comment and that generally means one of two things: either the spambot thinks you’re the perfect candidate for the viagra it’s selling or some other nerd wants to debate you on the finer points of your review. Wow…I just had to comment. I was totally blown away by your review. What a wonderful tribute to my writinge – I thank you for taking the time to write something that will certainly be something I’ll remember. It is comments like yours that makes all the long hours of writing, and worries and second guessess worth the effort. You honor me. The man writes a 500 page book and I’m the one blowing him away? Truth be told, I knew the man was a class act because this wasn’t the first time I’d personally heard from him. Last September, when I was first tackling the mechanics of how to make an ebook (do I use a software? do I learn HTML? do I cut off an arm and sacrifice it to the ePub gods?) I shot him an email asking him for advice. Like any fan correspondence, I assumed it wouldn’t go anywhere important but it was worth a try. I’ve cited him, numerous times, as my primary influence for throwing my hat into the ebook race. I got back a really awesome, incredibly helpful reply chock full of all sorts of HTML formatting goodness. Of course, some things are literally beyond me and this was one of them but I nevertheless swooned like a twelve year old at a Justin Bieber concert. It must be a writer thing. To say I’m over the moon, honored, impressed, and just downright floored to be mentioned not once but twice on the same review by a writer who’s been inspirational to me over the past year is easily the biggest understatement of 2012. It serves as a reminder to the impact our mentors and inspirations can have when we least expect. This turned an otherwise ordinary day into an unforgettable one that I decided to chronicle here. If there’s anything to be taken away from this incident, it is this: pursue what makes you happen with a relentless vigor, and when you encounter something that someone else has produced that brings you joy, be certain to spread the word. He wished to himself that he could save her and everyone else. A tiny, chaotic piece of hope that resided between the realms of the corporeal and the infinite stirred within him. Whatever spark of magic resided in his soul, he whispered to it to save them all. A little something from the project that I’m currently working on. I hope you like it!